We decided to divide our project into several subprojects to do experiments in parallel. The sub-projects are GATE, PORTER, and MEMBRANE projects. We also have SIMULATION project to evaluate design of each sub-project. GATE is the gatekeeper that allows only the target to enter the cell. Actually, is cylindrical DNA nanostructure connecting the inside and outside of membrane like a channel. Because GATE is made of DNA origami, electric repulsions caused by the negative charge of the DNA backbone prevent not desired DNA from entering GATE. In order to work as an injector (or extractor) a PORTER system is planted inside this cylinder (see next section). GATE is the gatekeeper that allows only the target to enter the cell. PORTER is in charge of the active transporting of the target into GATE. It is composed of single stranded DNA (ssDNA) sequences. Each ssDNA sequence is called Porter. These Porters are designed to transfer target DNA strands into (or out from) the membrane. <html></br></html> The first Porter is likely to be outside GATE because of its electric repulsion. Furthermore, the first Porter catches the target DNA and pull it inside the GATE by hybridizing with it. Inner Porters that have higher affinity than the previous Porter pull the target inside GATE step by step. PORTER is in charge of the active transporting of the target into GATE. 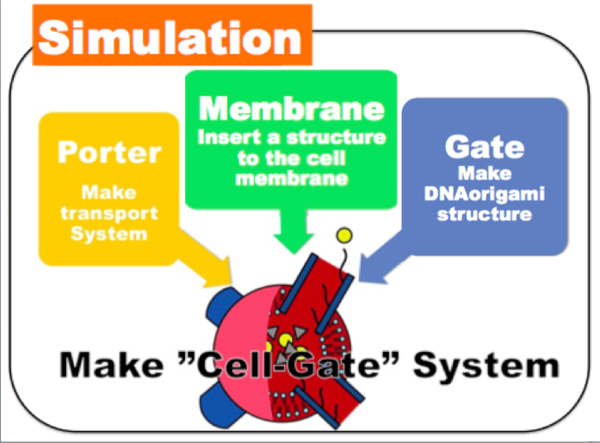 As active transporter, "CELL-GATE" should work in a cell membrane. Thus, a implementation module for inserting it to membranes needs to be designed. DNA sequences with a hydrophobic molecule (cholesterol) are attached outside and around GATE. 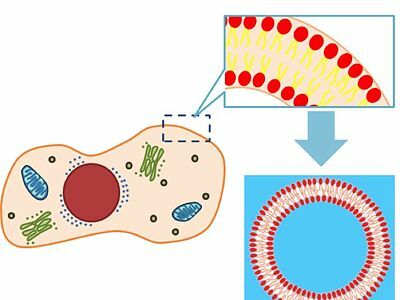 We use a liposome (artificial lipid vesicle) as a model for the cell membrane. The goal of this sub-project is to attach gate structure on liposomes and observe them by fluorescence microscope. This page was last edited on 27 October 2012, at 19:42.